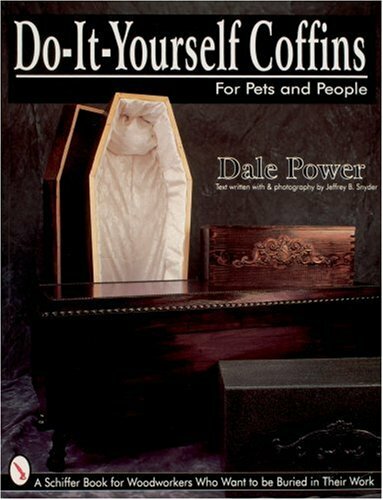 Dale Power departs from his usual animal carvings, burying himself in a new art form--the manufacture of special boxes for pets and people. Here's one project you won't want to put off till tomorrow. All of the tools and techniques needed to produce strong and beautiful coffins are presented here in clear, concise language. Color photographs illustrate every step in the construction of three pet-size and three human-size coffins. Detailed patterns are provided and different box construction techniques are revealed. One box design even doubles as a beautiful blanket chest or coffee table. Once the coffins are built, the discussion turns to the many moldings, appliques, linings, and finishes which may be used to make each coffin unique. A color gallery is also provided. With full color illustrations and detailed instructions, this book is a challenge to the novice and a joy for the experienced craftsman. Power, Dale/ Snyder, Jeffrey B. (Photographer)/ Snyder, Jeffrey B.